We offer London's largest schedule of genuine dates (460 as of 5:56am Mon). 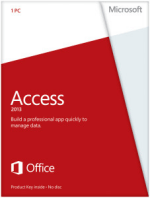 MS Access first arrived in 1992 in the form of Access 1.0, since then it has developed considerably into the latest versions known as 2003 and 2007 which are present in most home and business environments. Microsoft Access is a relational Database management system (RDBMS), meaning that Access stores data in a group of many related tables. The data stored in the tables can be accessed and manipulated by forms and queries and then presented in customisable reports. For the more advanced user MS Access can be extended and developed upon using the built in Visual Basic for Applications module. We are able to train you on all versions of Access with our MS Access Course, versions include 2010, 2007, 2003, 2002/XP, 2000 and 97. There are many more benefits of taking an MS-Access-course, but to for a better understanding of the knowledge you will take away from the course you should explore the different levels of Access training we offer, from our Access overview page you will be able to browse the course syllabus for each level and version of Access. Using our Support forum you can post questions on any Microsoft Office application to our team of Microsoft certified trainers. Our support forum is particularly useful after you have taken a MS Access Course in London and have had a few days to digest the course content, as all the questions you have are fresh in your mind. Our trainers will respond to your questions within 24 hours with our typical response time being within 4 hours. We have a quick and simple online booking system, so when you find a course and date that suits you, you can book it there and then either by credit/debit card or by invoice payment. You can book in confidence as we never cancel our courses. We have an online "Easy-Jet" style pricing system - the further ahead you book your MS Access course, the lower the cost! Just visit our pricing and availability page to check our live schedule for a MS+Access+course/ and to make your booking. Secure your place on one of our industry leading MS Access Course In London today. Browse the UK's largest schedule of training dates to find the right course for you. If you have any questions, our knowledgeable team are on hand to answer any questions you may have relating to your training. Contact us now.